By clicking on the map, you are taken to a larger version. To see the breakdown of “Country totals”, click on that hyperlink. So far, the figures show mostly Australian hits, but there have been visitors from seventeen other countries! 102 unique visitors over the weekend. Of course, me being red/green colourblind, red dots on green landforms aren’t terribly helpful (for me), but if I really concentrate I can eventually notice a difference. It will be interesting as the little red dots continue growing across Europe, the Pacific islands and the USA mainland, as Internet surfers the world over encounter the blog page through Google searches, etc. I know from my other blog, over at Blogger, upon which I have a “Sitemeter”, that these days many visitors seem to find my sites via a Google Images search, and this has been a changing trend in the past year. Either Google Images is more efficient than it used to be, or simply more people are using it to surf the ‘Net. Of course, that’s not to say they find what they’re looking for once they arrive. One of the mysteries of the Internet! ClustrMaps is a great reminder that the Web 2.0 world is always watching! Signing off… the external shoestring makeover? 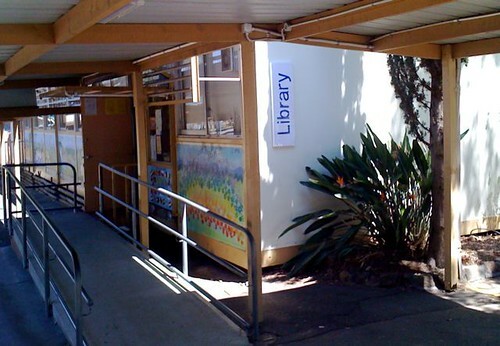 And so, with a Kevin Rudd BER new school library to be built on the site of my school’s existing, antiquated, portable library, further plans for renovating the current building went on permanent hiatus. I am very glad I only lightly nailed my internal signage to the walls, rather than gluing them, because almost everything I created in the last twelve months will be able to find a home in the new building. At the time of the announcement, I had already had a visit from Phyl Williamson, of Syba Signs, to give me quotations on perspex outdoor signage, an internal sign, a selection of poster hangers and mobiles, and vinyl lettering for the windows, etc. These ideas (and funding) have now had to await the new building, of course. I’ve been asked to do a presentation on my shoestring makeovers for an upcoming ASLA professional development day, at my school (Saturday 31st October) and, during the last school holidays, I suddenly found myself really regretting not being able to finish off my plan to get a large outdoor sign made. 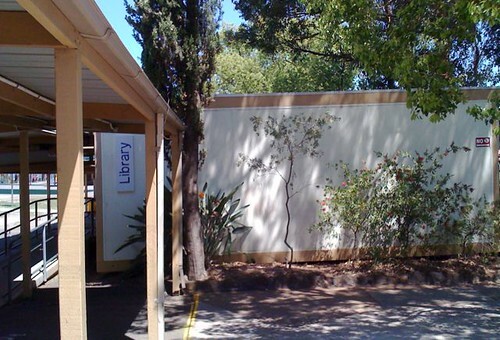 Something that identifies the building as a “Library”! My temporary external sign has turned out to be so successful, I wanted to share it. 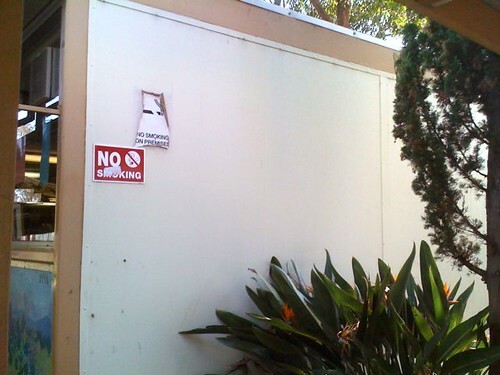 “No smoking, no smoking”, it says! 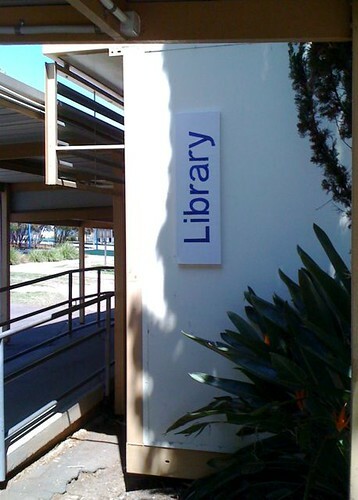 How would anyone even realise this was the school library? So, after several fruitless, forlorn visits to both Bunnings’ Hardware, and Spotlight, I went off to a local computerised signage supplier for a quote on a speedy-but-weatherproof sign that might impress people coming to my seminar session. The results were a little disappointing: only slightly less than a perspex sign and – no matter what – I’d be spending between $206 and $250 and still only ending up with one external sign. I did take one source of inspiration from my Bunnings trip: they had some long, pre-primed, stretched canvases for artists @ $35.00. Maybe I could pull off a miracle with a similar stretched canvas, if I could locate one the right size at a local bargain store? Bingo! “Cheaper Than Chips” at Penrith only had one, but it was a 31 x 102 cm “Paintwell” brand stretched canvas @ $15.95, plus $2.00 for a tube of “Ultra Blue” acrylic paint. Last night, I enlarged some lettering (upper and lower case, for legibility) from Word on the photocopier, transferred the design to the canvas, taped up the straight lines with packaging tape, and started painting – and suddenly there was a completed sign. NSW schools are almost ready to break for a well-earned two-week vacation, but there is already activity over on the “Bear & Chook” books rap blog site. This book rap, based on two picture books, “Bear & Chook”, and the newly-released “Bear & Chook by the sea”, is aimed at students in Early Stage 1 (Kinder) and Stage 1 (Years 1 & 2). It officially commences Term 4 Week 2 (26 October, 2009). 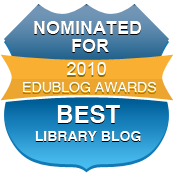 But please, by all means, drop by rapblog6.edublogs.org/ and have a look around any time. Several schools have already introduced themselves, there are some great comments turning up on the Teachers‘ section, and there are already things to look at in the Gallery. This book rap will also feature participation by the author, Lisa Shanahan, and illustrator, Emma Quay. An online video, of Lisa and Emma reading “Bear & Chook by the sea” at Caddies Creek PS, and answering students’ questions, will be an exciting addition to the usual teaching resources. The rap is being coordinated by Jenny Scheffers (TL at Caddies Creek), “Scan” editor Cath Keane, and yours truly. Interstate and international schools are welcome, and there is no cost involved in book rapping. Please join us, and spread the word! Don’t forget to bring your warm honey toast!